We’ve all been tempted by (and caved in over!) the ubiquitous fettuccine al fredo dish at Italian-American restaurants. Creamy, cheesy, garlicky goodness blanketed around tender, buttery noodles that beckon us to come to the dark side where diets don’t exist. Stay strong, my friend, neither your arteries nor your hips need that added cholesterol or those extra calories. 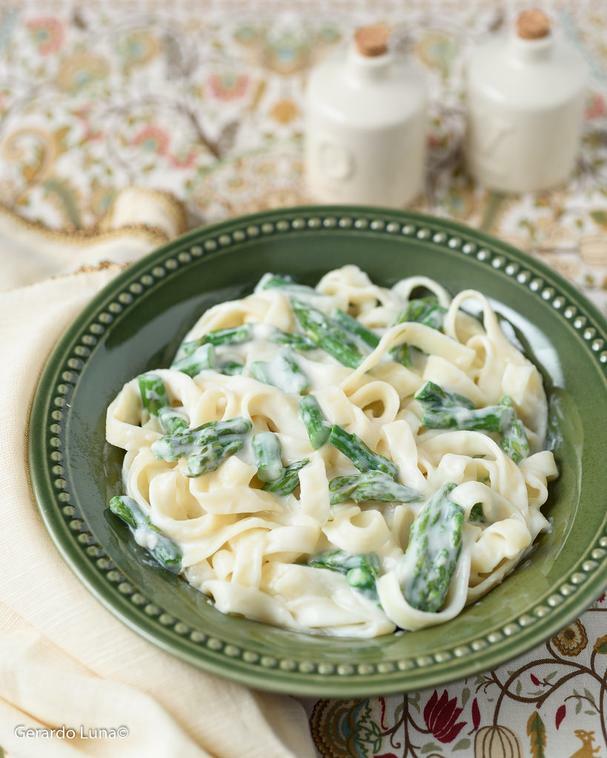 But we needn’t go through life without the joys of a decadently creamy pasta dish. This healthier-for-you fettuccine al fredo recipe skips the heavy cream and boat load of cheese (though it still has the latter!) and instead gets its creaminess from an easy to make white sauce made from 2% milk, chicken stock, and flour that’s seasoned with garlic and olive oil. Toss in some leftover chicken (or grill some up) and asparagus and you’ve got one darn good guilt-free meal! Bring a large pot of salted water to the boil. Cook the fettuccine according to package directions. Drain and reserve. Heat a large saucepan over medium heat. Add the olive oil and garlic. Cook until the garlic is aromatic, about 1 minute. Whisk in the flour and continue to cook for one minute more. Add the stock and milk, whisking constantly until the sauce thickens, about 5 minutes. Stir in the cheese and asparagus. Turn down the heat to low and cook until the asparagus is crisp tender, about 2 minutes depending on the size. Stir in the chicken and fettuccine. Taste and adjust seasoning with salt and plenty of freshly ground black pepper.